Face up to the disease and shape your life yourself – the Lily Turtles meet once a month to do just that. The self-help group has been drawing attention to lip- and lymphoedema disorders and explaining treatment options since 2014. The members had a guided tour of the factory at medi GmbH & Co. KG in Bayreuth. 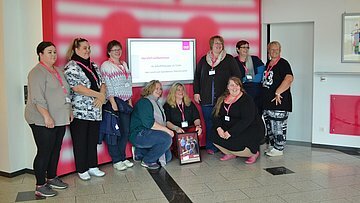 In September 2015, nine women from the self-help group "Lily Turtles" visited the medical device manufacturer medi in Bayreuth. Many of them wear compression garments (such as the mediven 550 leg garments) and wanted to find out on site how they are made. The members of the self-help group discuss their experiences and exchange views and information on lip- and lymphoedema – two disease forms that are still little known in Germany. The ladies show that the illness does not dictate their lives, but that the condition can be integrated in day to day living. Many patients are advised to stick to a diet and play sports, but these alone only have little effect on the patients' size. 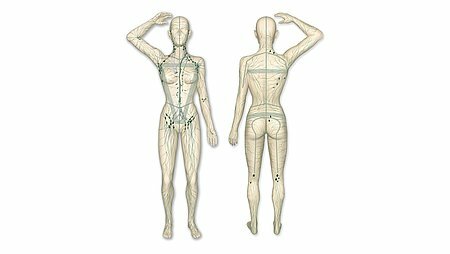 Lymphatic drainage and wearing medical compression garments every day relieve pain, reduce swelling and boost the flow of blood and lymph. 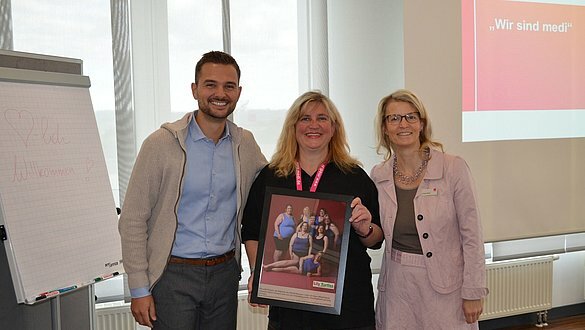 Katja Wagner, the initiator, breathed a sigh of relief when the correct diagnosis was finally made after 28 years: lipoedema. "That was a great weight off my mind after all those years. At last I knew what was wrong". She has been wearing flat knit, made to measure compression garments for over five years now and is delighted. "I wouldn't want to start off any day without compression any more. If I occasionally don't put the stockings on, I feel the changes and the pain right away". medi sales representative Silvia Günther informed the group about rollouts and also organised the visit to medi. "The better the patients understand the medical device, the more successfully they use it" she says. This understanding was clearly conveyed during the guided tour of the company. 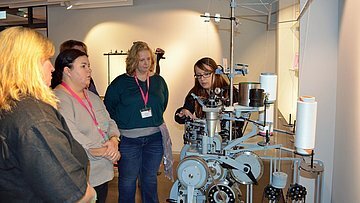 The women followed with keen interest the explanations to each individual process step of the manufacture of compression garments – from the knitting hall to finishing and dispatch. Franziska Muth, another member of the self-help group, was fascinated by the high-tech production. "I was really impressed by the number of steps in production and how sheer the strong stockings are". Katja Wagner showed off her compression garments in the new shade cherry-red. "I love wearing bright colours and I don't hide away, my lipoedema is a part of me. Many people look at my stockings with great interest and I'm then more than happy to give them information about the disease". The Lily Turtles now understand a lot more about how a compression stocking works. This knowledge strengthens their motivation to wear the long-term care garment day in, day out. At present, the self-help group for lip- and lymphoedema has 12 members aged between 21 and 83. The group meets on the first Wednesday of every month at 18:30 in Winsen (Aller) and they also get together regularly to go power walking and swimming. Katja Wagner will be pleased to field your questions on +49 (0)152 29526880 or by email to wildung-winsen@gmx.de.